We are looking for a candidate to fill Microsoft Dynamics AX Finance Consultant USA position, who is authorised to work in the USA. 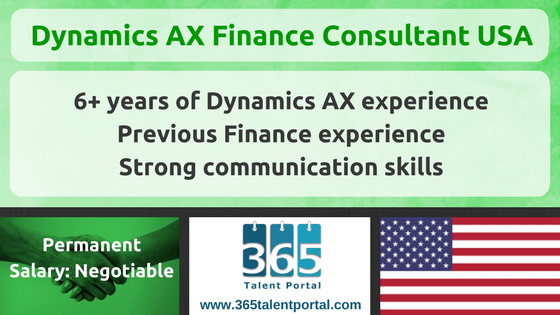 As the Dynamics AX Finance Consultant USA role requires, you will use your strategy and operations consulting skills, business process knowledge, and other methodologies and tools to quantitatively analyse issues and drive solutions to transform our client’s business. You must have a good knowledge of the AX financial modules and preferably hold certification in the most current versions. You will be responsible for reviewing client business processes, re-engineering the client’s processes to improve efficiency, and performing many of the functional tasks required for a successful AX implementation. We operate nationally with consultants based in various cities throughout the US. Utilize applicable AlfaPeople Methodology phases, activities and tasks to deliver quality work products for clearly defined projects in one of the following areas – Analysis, Design, Testing, Implementation, Support and Maintenance. Understand customer needs. Perform gap analysis between package functionality and customer requirements. Understand documentation standards, and be able to create all standard project documentation.